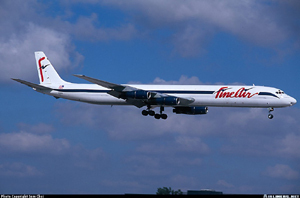 Fine Airlines Services, Inc., (Fine Air) Flight 101, a McDonnell Douglas DC-8-61 was a cargo flight, scheduled from Miami, Florida to Santo Domingo, Dominican Republic, on August 7, 1997. During takeoff from runway 27R at Miami International Airport, after becoming airborne, the airplane pitched up sharply, reaching an altitude of approximately 600 feet. Witnesses stated that the airplane achieved a nose up attitude of approximately 70 degrees before apparently stalling and then crashing. The three flightcrew members and one security guard on board were killed, and a motorist was killed on the ground. The airplane was destroyed by impact and a postcrash fire. The National Transportation Safety Board determined that the probable cause of the accident was an incorrect loading of cargo that resulted in an aft airplane center of gravity, and a correspondingly incorrect stabilizer trim setting, precipitating an extreme pitch-up at rotation. The improper loading was the direct result of (1) the failure of Fine Air to exercise operational control over the cargo loading process; and (2) the failure of Aeromar (the cargo loader) to load the airplane as specified by Fine Air. Investigators also concluded that factors contributing to the accident were the failure of the Federal Aviation Administration (FAA) to adequately monitor Fine Air’s operational control responsibilities for cargo loading, and the failure of the FAA to ensure that known cargo related deficiencies were corrected at Fine Air.